The client wanted to evaluate the business potential for a unique and globally successful infant care concept in India. It engaged Medium to conduct a detailed feasibility study, firm up relationship with the overseas franchisor, develop a comprehensive blueprint and help execute it to achieve significant traction. 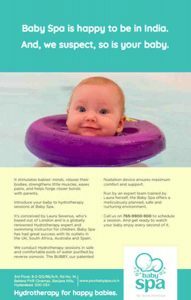 The owner and franchisor of an innovative hydrotherapy-based infant care facility concept had created successful footprints in countries like the UK, South Africa and Australia. Our client – a business house in South India with no prior experience in healthcare – was keen to explore the possibility of bringing this concept to India. Decision related to infants have multiple stakeholders and are quite sensitive. Moreover, a concept aimed at the affluent segment is generally niche, with very high customer service expectations. Medium helped evaluate the business potential, map out a detailed blue print for the pilot facility in Hyderabad followed by meticulous execution. In-depth interviews – in line our unique ‘Guided Conversation Framework’ – with new mothers, paediatricians and child development experts helped us evaluate the potential and identify the critical success factors while ‘localizing’ the concept. Our detailed blue print encompassed a business plan, project plan for the launch facility, and operational strategy including modules such as HR, marketing, pricing and customer experience. Medium’s on-ground execution support included virtually all the elements starting from negotiations with the international franchisor for Master franchise for the whole country. We helped in selecting the site and an experienced architectural firm. We provided the design brief and managed the entire construction phase. In line with our recommendation to focus on the clinical aspects, we helped recruit and train the entire team for the pilot facility. And finally, we helped design and execute the marketing strategy by adopting a meticulous approach to select and engage with the right creative, digital marketing and PR agencies. The pilot facility received extremely encouraging response with impressive media visibility and the customers rating their experience at the facility very high. The facility is on schedule to achieve planned revenue, with plans to launch another facility in the same city and expand to other cities in India.